In late 1991 General Greene Council headquartered in Greensboro merged with neighboring Uwharrie Council of High Point, NC. 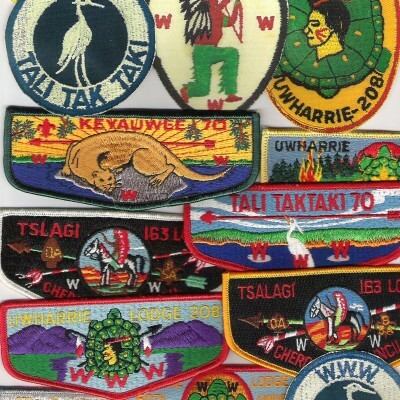 The charters of the affiliated Order of the Arrow lodges, Tali Taktaki Lodge 70 and Uwharrie Lodge 208, expired on December 31, 1991. The new council was named Old North State Council and on January 1, 1992 a new lodge was formed. The lodge chose the name Keyauwee, the name of a local Indian tribe, the number 70, and the River Otter as its totem. In 1994 Cherokee Council, headquartered in Burlington, NC, merged with Old North State Council. Tsalagi Lodge 163 merged with Keyauwee Lodge 70. The new lodge was named Tsoiotsi Tsogalii Lodge 70. The name means “We Three Friends” in Cherokee. The red-tailed hawk is the lodge’s totem.